This darling dress of navy and white lace features a bow you can tie at the neck and a trim navy waistband. A classic, graceful dress! Slip on and look gorgeous without any fuss. You're guaranteed to be the belle of the ball in this dainty, graceful piece. 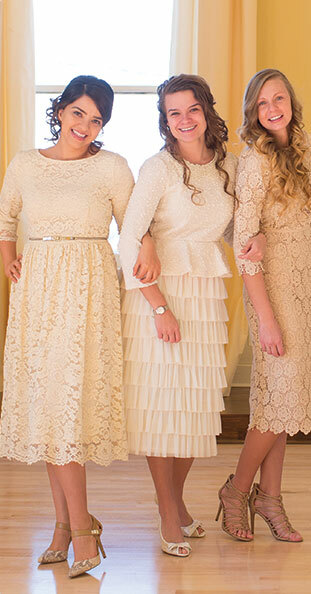 Attractive and modest in every way, this dress is ideal for church, weddings, and special occasions. Navy and Ivory lace stripes. My favorite dress yet!! I absolutely love it!! I bought it in long length and it fits my 5'0 frame just right without needing to be hemmed! Love the high quality and the modesty of the dress!! I highly recommend this dress!! This dress is wonderfully flattering! The lace detail is a very high quality. My most favorite dress yet! I wore this beautiful dress and absolutely LOVE it!!! I was told over and over wherever I went ... I love your dress!! I bought in long length and it was just right didn’t have to be hemmed !! This is my fav!! Great job Dainty Jewels ! !